A new discovery at OMRF could fundamentally change how scientists study age-related muscle loss. Age-related muscle loss, called sarcopenia, happens to all of us as we age and is a major cause of disability and loss of independence in the elderly. Currently, no effective pharmacologic treatments exist for sarcopenia. 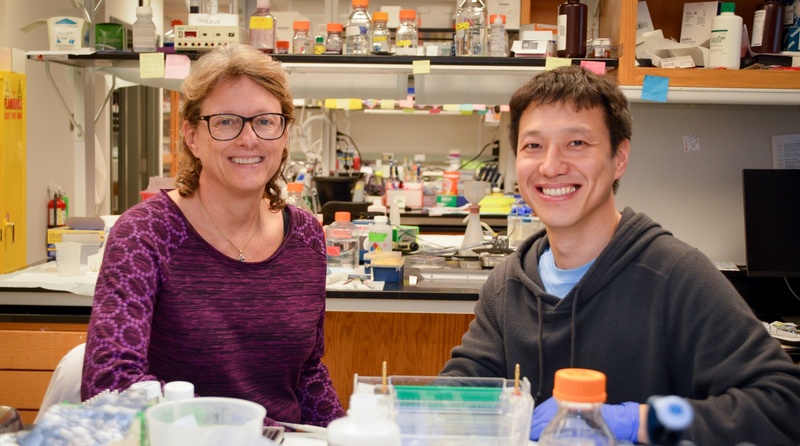 New findings from OMRF’s Holly Van Remmen, Ph.D., and Bumsoo Ahn, Ph.D., show that specific cellular processes once thought to cause muscle loss in the elderly actually do not. This work could shift the development of potential drug interventions in the future. In the lab, Van Remmen and Ahn study the loss of vital muscle as we age. Specifically, they look at the role played by oxidative stress, the imbalance caused by by-products of metabolism called free radicals and the body’s efforts to rid itself of these molecules. Each cell is like a tiny city, said Van Remmen, and structures called mitochondria function as the city’s power plants. As cells process oxygen for power, the mitochondria emit free radicals, harmful by-products of oxygen. “Over time, this free radical ‘pollution’ can build up and cause oxidative stress,” she said. Researchers had believed that oxidative stress generated by mitochondria contributes to muscle loss. But in a series of experiments in mice, OMRF scientists found this wasn’t the case. “This isn’t at all what we predicted, and a substantial number of our experiments show some of the pathways we were studying might have no impact on muscle mass at all,” said Van Remmen. Ahn said the discovery could alter how future studies are designed as scientists try to determine what causes weakness and atrophy in aging. The findings appear in the Journal of Cachexia and Skeletal Muscle. This research was supported by National Institutes of Health grants P01AG051442, R01-AG047879, R01-AG055395, P30AG050911, T32AG052363], and 5P30GM114731. The United States Department of Veterans Affairs also provided funding support.